Geoff Leo has been a reporter for CBC News in Saskatchewan since 2001. His work has won numerous awards. In his 30 years as an immigration expert, Richard Kurland said he's only ever heard rumours of people paying money for job offers to foreign nationals. 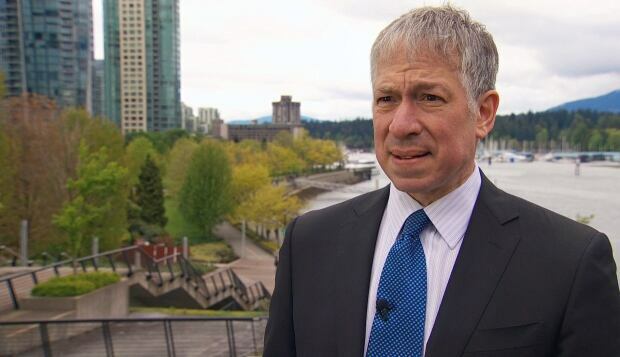 "It's almost the stuff of immigration legendary myth that there are envelopes of cash being passed around for offers of employment in Canada," said the Vancouver-based lawyer and immigration policy analyst. But he said a case CBC recently uncovered in Saskatchewan is "the first time on record someone was caught" — as he put it — "green-handed." In an undercover investigation, CBC's iTeam recorded an immigration consultant offering to pay a Prince Albert, Sask., business owner cash in exchange for a letter offering a Chinese national a job. And it may, in fact, be part of a larger scam. As an extra incentive, he offered to pay Reid $15,000 in cash. He called it a "training fee." The offer raised Reid's suspicion, so she contacted CBC's iTeam, saying, "It sounds pretty sketchy and something just can't be quite legal with the whole process." CBC recorded two subsequent phone calls between Reid and Sui, who was unaware the calls were being recorded. In one of those conversations, Sui explained the details of his $15,000 offer to Reid. "Usually we give cash, because usually our owners have a really high personal income. So, I just give them cash to save their tax and also save tax for our company," he said. Sui told Reid everything about this program was on the up and up. "I'm not trying to hide anything," Sui told Reid. "Basically, this is a government program. It's a benefit for you to get some cheap labour and skilled worker because you pay taxes." He said the Chinese workers would be brought in through the skilled worker category of the Saskatchewan Immigrant Nominee Program, which allows the province to recommend qualified foreign nationals for landed immigrant status. Sui said because the skilled worker category requires a job with specialized skills, Reid would have to give the job an impressive-sounding title; the new immigrant couldn't just be called a cashier. Reid explained to CBC what Sui originally proposed to her: "It would have to be like a 'buyer' or something like that, so it looked good coming to Canada." In a recorded conversation, Sui assured Reid other businesses had already signed on, listing off restaurants and electronic stores as examples, though he didn't provide names or locations. Sui said Reid would be able to pick the worker she wanted from a stack of resumés. He assured her there would be no long-term commitment. "We cover first three months wages just like probation period for you to try them out," he said. "If he works well, he can stay. If you don't like him or he doesn't make enough profit for you, I just find another job for him." Even if Reid let the worker go, Sui said, "you keep the $15,000." CBC's iTeam followed up with Sui through the cellphone number he left with Reid, asking him about his offer of cash and wages in exchange for a job offer letter. Initially, he denied having made that offer to Reid. When CBC told Sui it had been recording his conversations with Reid, he said, "It's illegal [to make an] audio recording without mentioning it, right? You know that." CBC pointed out that it was in fact legal and approved under CBC's ethical guidelines. Sui ended the call. CBC then approached the owner of Vstar, Nicole Sun, about Sui's activities. She said Sui had never worked for Vstar. "We don't have any payroll for this person," she said. "Who is Bill Sui?" 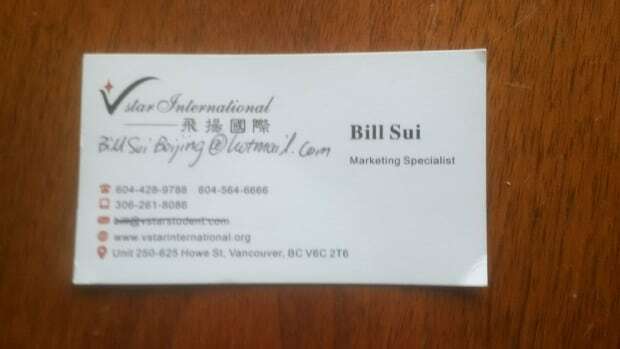 CBC pointed out that Sui carried a Vstar business card. In addition, he had a Vstar email address. CBC also recorded Reid calling Vstar's main number to ask for Sui. The receptionist said he wasn't in, but offered to take a message. A few minutes later, Sui called back. "You're looking for me or something?" he asked. According to immigration consultants CBC contacted, a skilled worker application typically costs between $3,000 and $8,000 — assuming the foreign national has secured their own job. 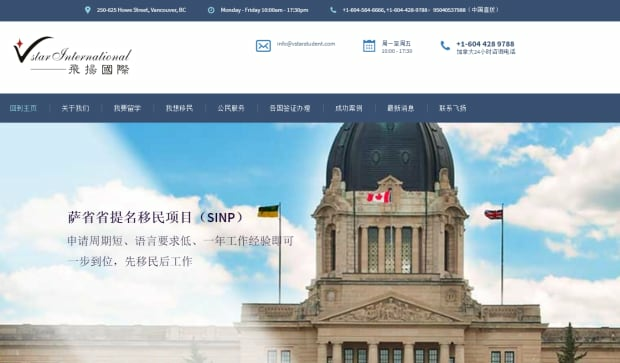 On its website, Vstar boasts that it has helped many Chinese people immigrate to Saskatchewan, Manitoba and British Columbia, but it doesn't reveal what it charges for this service. CBC's iTeam wondered what Vstar charged, so Chinese-speaking CBC journalist Sharon Wu contacted the company and posed as a Canadian helping her Chinese relative and his family emigrate to this country. The owner of Vstar, Nicole Sun, told Wu the company charged Chinese nationals $200,000 for the skilled worker application. "This is the fee charge for the entire immigration application process," Sun explained to Wu. "It's the money you pay for your family to get residency status." Sun confirmed that Vstar has a pool of employers who are looking for Chinese immigrant workers. "We have employers from all types of industries," Sun said in the recorded conversation, which has been translated from Chinese. "We have big companies who have over 80 staff — most common ones have 10-ish employees." Sun said she would examine the resumé of Wu's relative and find an appropriate placement. She said the $200,000 would be paid in instalments and "we often guarantee within three months the applicant will definitely get a job offer that makes a good fit for him. If not, we will refund all we have charged." Wu asked if her relative would actually have to go to work at the job once they arrive in Canada. Sun said not necessarily. "A lot of applicants don't want to work here, they only want to pay some money as a simple way to get a residency status. This is also fine." Sun assured Wu "we have never had a single case that's been rejected so far." Two days after that conversation, CBC's iTeam called Sun to ask her about what she had told CBC's undercover journalist. CBC asked Sun if Vstar helps Chinese nationals find jobs in Canada. Sun said absolutely not. "No, we don't help them find jobs. They find jobs by themselves," she said. "We just, like, follow up with the immigration process once our clients, like, they find a job." When CBC pointed out that we had a recording of Sun offering to help Wu's relative find a job, she seemed surprised and began to shift her story. She conceded that from time to time, her agency may help some people find an employer. "But we don't charge for that service. We have some connection with some employers we know they need people. But in our agreement, we never charge for that fee," said Sun. Sun also denied that Vstar charges $200,000 for a skilled worker application, though she refused to disclose what her company actually charges. Sun abruptly ended the call, saying she had to go to a meeting, promising to answer additional questions later. CBC followed up with her on several occasions but she refused to continue the conversation. Richard Kurland said "every alarm bell goes off with this one." He said that if Reid had accepted Vstar's offer, that would have qualified as a fake job. "The deal is really quite simple. You don't take money, let alone cash money, for a job offer made to a foreign national — a foreign national you've never met, interviewed, looked at their credentials. It's not a real job offer," said Kurland. "It's fraud when a person gives money to get a job offer that opens Canada's door to permanent residence," said Kurland, who for almost 30 years has edited a prominent Canadian immigration publication. "The violation of the immigration laws is crystal clear when you see cash for a job offer and advance payment of salary and deductions at source." Kurland said it's not surprising that Sun would deny receiving payment from a would-be immigrant in exchange for finding a job, as that would be illegal. However, he said the facts of this case require greater scrutiny. "Here's the common-sense observation," said Kurland. "The $200,000 is coming from this applicant. So even if [a company] doesn't directly pay for job-finding services, part of the $200,000 eventually is used for the purpose of a job-finding service." He said from his experience, the paper trails on immigration applications like this can be complex and involve multiple companies — a complex web created by lawyers and accountants. Kurland said it's possible to create structures that appear on the surface to comply with the law, "but they get around the intent" of the law, which stipulates no money in exchange for a job offer. He said the cash payment combined with the high fees should seize the attention of the authorities, in particular the Canada Border Services Agency. CBC presented the basic facts of this case to the CBSA. In an email, the organization said when there is evidence of a violation, the organization "thoroughly gathers, reviews, and assesses all the evidence before prosecuting." It pointed out "these investigations are complex" and often involve other government agencies. CBSA said it lays charges for a range of issues, including misrepresenting the facts and making false job-offer documents. Kurland said that in his view, "there's enough there to allow CBSA to seek evidence from every person connected to this transaction." "There's a lot on this silver platter," Kurland said. "There's no excuse for doing nothing." Have a tip about this story? Contact the CBC iTeam's Geoff Leo at geoff.leo@cbc.ca.